If you are in the market for a Samsung Galaxy Tab then you can pick one up today in the UK. The initial expenditure on the device itself all depends on the 3G internet contract you wish to take with Samsung's new tablet PC. Sammy's Android Froyo-powered 7-inch Tab device may well have been rubbished by the likes of Google and Apple, yet the mini tablet PC running Android 2.2 is certainly going to appeal to those users that don't want to spend that extra bit of money on an iPad, but want a decent touchscreen tablet. 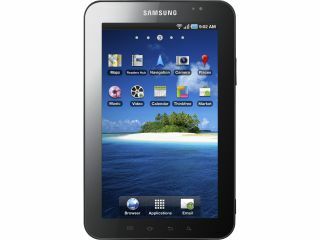 The Samsung Tab is coming to all the major UK mobile networks in time. Right now you can check out the deals over at the Carphone Warehouse, with a number of different data plans on offer, ranging from £399.99 through to £529.99.